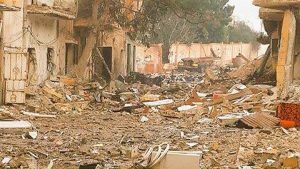 In Benghazi’s Sabri district today, there has been more heavy fighting in which at least three Libyan National Army (LNA) soldiers have died and a significant number have been injured. The LNA has not issued official casualty figures but there has been a steady flow of ambulances taking the wounded away from the frontline. Armed forces commander in chief Khalifa Hafter used a broadcast to praise the efforts of the soldiers and to tell them that the end of the Benghazi battle against the militants was in sight. As with the final stages in the fight to take Ganfouda, it appears that the militants are putting up a ferocious defence. At least two soldiers were shot dead by a sniper, who LNA sources say, was then himself shot and killed by an LNA marksman. In their slow advance today, soldiers reportedly took control of the Al-Thadi football club and surrounding buildings. A single shell fired from inside Sabri landed in the Salmani district on the Shamal football ground, damaging shops but causing no casualties. Troops today discovered the body of a soldier who went missing two years ago. Mohammed Al-Barghthi disappeared in 2015 during one of the LNA’s first operations against Suq Al-Hout. It is unclear how he died or how his corpse was discovered and identified.